Beers, like animals, can be endangered species: some can even go extinct. Nobody’s seen West Country White Ale in the wild for more than 125 years. Camra, I’m very pleased to say, has recently decided that it could be doing much more than Make May a Mild Month for promoting endangered beers, and has set up a Beer Styles Working Group to look at ways of plugging and encouraging endangered beer styles of all sorts. I don’t normally get involved in exploring American beer history, not just because there are people far better qualified than me to do the job, but also because I know how easily I could make a fool of myself for lack of local knowledge: like the American who wrote a book about Guinness and said that the Park Royal brewery was “about 25 miles northwest of Central London”. That would put it out around St Albans, instead of the 10 miles or so from Charing Cross it really was. 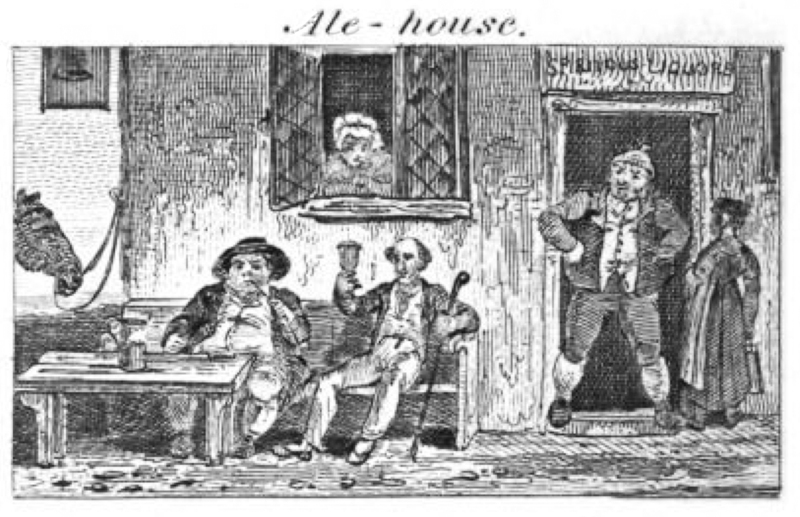 However, I do like occasionally digging around in any evidence showing how much continuing British influence there was in the American brewing scene in the 19th and early 20th centuries: and while looking for stuff on the history of English brown ales I found – serendipity again – some fascinating stuff on American brown ales many decades before Pete’s Wicked. 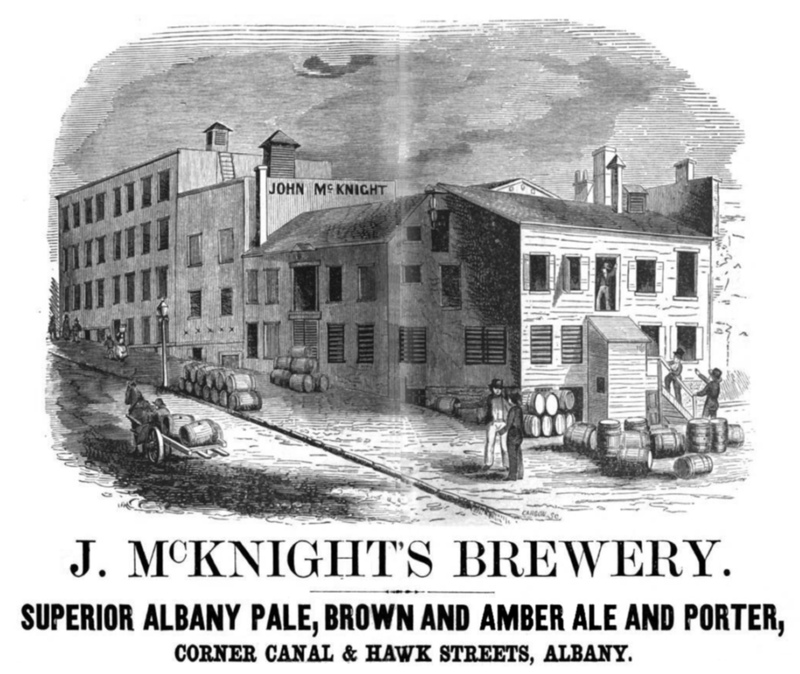 I’ve seen almost no evidence of brown ale being brewed in the US before the 20th century: the ad up there for “pale, brown and amber ale and porter” from John McKnight’s brewery in Albany, New York, which appeared in a directory from 1853/54, is the only example I know. However, amber ale was certainly around, and Burton Ale looks to have been even more popular than I had previously supposed: Trow’s New York City Directory of 1862 has four brewers (out of 21 who had taken adverts in the directory) offering Burton Ale, alongside “pale, golden and amber ales, porter and brown stout” (and only one lager brewer in the lot). The ability to deny the evidence of your senses is widespread. There’s the dictator insisting to television interviewers that his people love him, while across the country those long-oppressed people are taking up arms and waving the flag of liberation. And on a much less serious plane, there are people who will insist two beers that look totally different, taste totally different and are produced in totally different ways are variations of the same type. It’s like setting up a category “horse” and insisting the seahorse and the clothes horse are its sub-categories. That’s slightly more ridiculous than insisting that Newcastle Brown Ale and Mann’s Brown Ale are sub-types of something called “English Brown Ale”. But it involves an identical confusion between “name” and “category”. I don’t actually have any problems with the idea of “beer styles”. Labels can be very useful. But only if they’re meaningful. When I read that someone is going to be brewing “an English Brown Ale”, I have no idea what sort of beer they are intending to produce. Look, here’s Newcastle Brown Ale, the urtyp “northern brown ale”, so-called. It’s “brown” only in the sense that if I had a pair of shoes that colour I would probably call them “brown”, if I didn’t call them “tan”. The beer is made – or was made, the method has changed, certainly since production was moved from Tyneside to Tadcaster in North Yorkshire – by mixing a low-gravity beer brewed at about 1030 OG (and sold separately for many years as Newcastle Amber Ale) with a matured, darker (from crystal malt and caramel) high-gravity beer to produce a blend with an abv of 4.7 per cent. The high-gravity beer gives fruity notes to the blend, and a final colour that is much the same as or only a little darker than many traditional English bitters, and certainly paler than, for example, Young’s Winter Warmer (which is a Burton Ale). The sweeter, maltier characteristics are more forward than you’d find in a bitter/pale ale, and there’s less of the hop apparent than would be found even in a Burton: bitterness, I believe is 24 IBU. Then there’s Mann’s Brown Ale, the urtyp so-called “southern brown ale”. Brown? It’s almost black. That colour comes from roasted malt, and as you’d expect this is a beer with distinct chocolatey, roasty flavours (though less than you’d find in a stout or porter). It also has considerable sweetness (another one of the differences between this style of brown ale and stout – and Newcastle Brown Ale) and almost no hop character (brewers would use Mid-Kents and other non-premium hops for brown ales, and old hops as well, where the aromatic qualities had vanished but the preservative ones remained). Apart from the name also containing the words “brown ale”, Mann’s is utterly different from Newcastle Brown Ale. How can anyone with their brain not in “standby” mode think it works at all to ram these two very dissimilar beers under a single category called “English brown ale”? 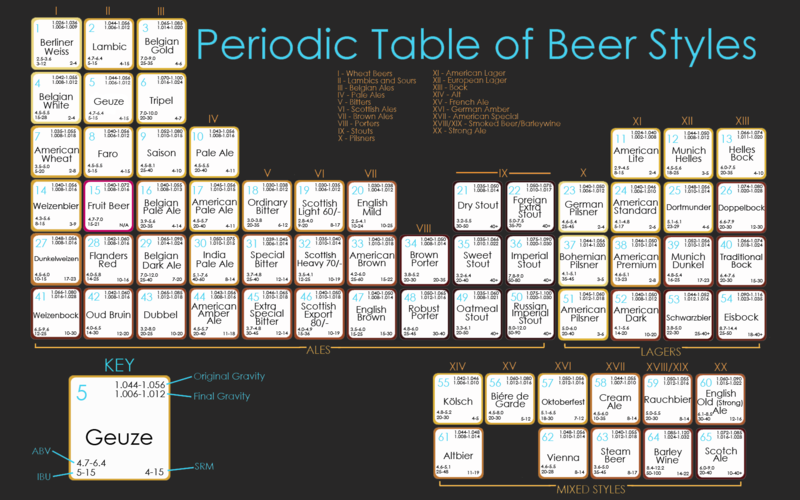 Someone has produced a beautiful “periodic table of beer styles” you can see here, it’s a lovely piece of graphics, based on the familiar periodic table in chemistry, but grouping beers into families of styles, rather than chemical elements. It’s obvious that a huge amount of care and craftspersonship went into the creation of the “beeriodic table”. It looks lovely, and I’ve no doubt many, many beer geeks will print it off and pin it up on their walls. It’s obviously been put together by somebody who loves beer very much. I admire enormously their dedication, and their skill: it must have taken hours, days to do. It’s a great piece of design. And it’s wrong, totally wrong, in so many ways.